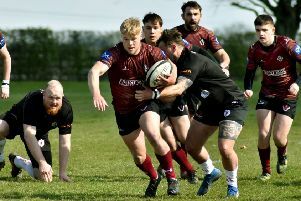 Melton RFC head coach Gareth Collins believes the club are still in touch with their pre-season targets despite a disrupted first half of the campaign. The First XV lie eighth in Midlands One East heading into the new year after a mixed bag of a season to date, with six wins and eight defeats. Back in September Collins had designs on a top-six finish and an improvement on last season’s position of sixth. The latter aim may ultimately fall a little beyond Melton’s reach, but a place among the top six remains a definite possibility. “At the start of the season we were looking to improve on last year, get in the top-six and finish as high as we could in that,” Collins said. “But two of our players decided to get married mid-season so we lost a lot of players to stag do’s for two weekends which meant we were really up against it. After winning their opening game of the season, a run of eight defeats in 10 matches may have caused a few nervous glances over shoulders towards the bottom end of the table. But a good end to the year has left supporters with reason to look upwards once more. “We had a very difficult period in the middle where we struggled with injuries and player unavailability,” added Collins. “It meant we had a real dip in form, but we have come out of that and won three on the bounce before the last match which put us back into a reasonable position. “But it’s a fair reflection of where we are in terms of the squad. “We haven’t been able to compete with the top sides, but we have also won some other matches very well, too. As well as injuries to senior figures Sam Badham and Klay Radford, Melton also lost Wayne Brookes and Mark Matthews to retirement early on in the season. “Wayne was undecided whether to carry on this season and I persuaded him to,” explained the head coach. “But he got injured in the second or third game and then made his decision. “Prop is a key position and although we have some good young lads who have come in, it takes time for them to adapt. While the selection headaches have been unwanted, they have also shown off the club’s improved strength in depth. These are the rewards of investing more time and energy in the Colts set-up and Second XV over the last three years. Collins added: “The guys that have stepped up have done themselves proud, it’s just difficult to get the results against top sides. “We have plateaued as a squad and need to rebuild for next season and beyond, but we have a lot of players coming through and the level of the squad is improving. “Our longer-term ambitions are to keep the club in Midlands One for the next two seasons, but we will take it one year at a time.